I ride a bike. No, I'm not a Lance Armstrong wannabe, but I do enjoy pedaling to work. It's relaxing, it's a bit of exercise, and it's a good stress relief on the way home. I'm generally in my work clothes (business casual), so I'm not doing anything to get really hot or sweaty in the mornings, but in the afternoon I make it a point to sprint home as quickly as possible. There are a couple of small hills, and I try each day to get up and over them quicker than the day before. This means I'm probably moving quicker than you might guess. 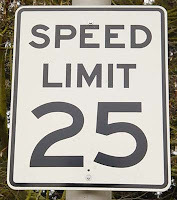 No, I'm not setting any speed records, but 25 mph isn't out of the question, and hey, that's the speed limit on these city streets anyway. Between work and home I have 3 stops signs that I deal with. The rest of the trip I have a clear shot on one street with no stop signs, but there are total of 11 cross streets for my trip. I'm leery of the cross streets - in the years I've lived in this neighborhood I'm very aware that people in cars just don't stop at the cross streets. Even before I was riding my bike to work there were many instances where some knucklehead would run the stop signs and almost hit me. It's a bigger issue now on a bike. At least in the car I felt I had some protection, but on a bike my only protection from these irresponsible drivers is my own awareness and common sense. 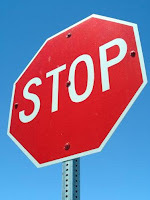 This past week there were two instances where I encountered someone that didn't feel it necessary to yield any sort of right of way or obey the stop signs. In both cases I made eye contact with these individuals before they decided to cross directly in front of me. Each time they recognized me, and I assumed they were going to allow me to go by. Each time I was partially in the intersection when these licensed drivers decided to go. Both times required me to stop way more quickly than I like. Fortunately, both times I was expecting such behavior from the drivers, but gee whiz -- it's one thing to just be unaware that I'm on the road, it's another to look me directly in the eyes, and then decide that since you're in a car that I will just have to stop where I'm not required to allow you to give in to your impatience and self-importance. Look, I'm moving pretty quickly. Frankly, I'm going just as fast as I would be even if I were in a car. You would have waited for me if I were in a car. You can wait on me if I'm on my bike. For that matter, you're supposed to wait. I'm following the traffic rules -- and not just because I'm just being a goody-two-shoes, but I follow the rules for my own safety. If I can make the effort to follow the rules, you should too. It's a shame that there are drivers out there that just don't care about bicyclists. It makes it tough to encourage other people to ride their bikes to work. They know that these idiots are out there and they're just too afraid of getting run down by people that don't care or just aren't paying attention.